Probably one of the most misunderstood aspects of lawn care is properly watering the grass. Watering for to long or not enough are the most common mistakes homeowners make. But done properly it can result in a good looking, healthy lawn thats the envy of the neighborhood. Here are some lawn watering tips to keep your landscape looking good all growing season long. The most efficient and effective way to water your lawn is to make sure that you soak the soil long enough for the water to penetrate down to the lowest part of the root zone. For bluegrass this is generally 6 to 8 inches deep while most other grasses are in the 8 to 11 inch range. The idea is to get water deep into your lawns active root zone but doing so does require a bit of lawn watering research over the period of about a day. Heres how you can do it using a simple formula devised at a well known university. Turn on your sprinklers and let them run for 15 minutes then wait for twenty fours. When that time is up dig a small hole to determine how deeply the water penetrated. There are also moisture probes that can do the same task without digging a hole. 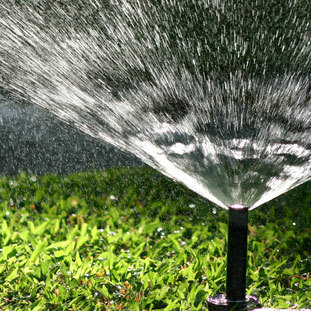 You can use this data to figure out how long you need to run your sprinklers when you water. To do this take the depth of the moistened soil you calculated and divide 120 by that number. So if the water soaked to a depth of 5 inches your formula would look like this; 120/5 = 24 minutes. So it will take 24 minutes of watering to soak your soil to a depth of 5 inches. To get 10 inches of water penetration you would need to water for 48 minutes. Once you establish how long you need to water your lawn do not deviate from this schedule. Youll also need to keep an eye out for water runoff before the designated time is up. If water does start to run off your lawn turn the water off for an hour to let the water soak in; after an hour has passed turn on the water and finish the allotted time period. Another question on many homeowners minds is when is the best time to water? Early morning is the best time because the temperature is cool and there is seldom any wind. This ensures that little water is lost through evaporation or gets windblown away from the grass. Watering later in the day or evening can help mitigate evaporation loss but exposes your lawn to diseases because it stays moist over night. Another thing to be aware of is recognizing when your lawn needs to be waters. If the blades of grass begin to fold or roll and they begin to exhibit a bluish or dull green color it is a good indication that the lawn needs water. Also watch the how fast the grass rebounds after walking on it. If the grass does not spring back up after walking on it you need to increase your watering times. Watering your lawn is just a matter of giving the grass the amount of moisture it needs to flourish. By following these helpful tips you can have one of the best looking yards in your neighborhood.